It’s been a while since I posted a recipe … and the cold has me thinking of food … so here’s one of my staples. Use it or lose it! This is one of the things you will ALWAYS find in my freezer frozen in various size portions for a nearly instant dinner anytime. And this is a pic of it bubbling away on my stove. This versatile and no fail mince sauce recipe can be used in a lasagne, on a baked potato, on pizza, in toated sarmies, in cottage pie, or frozen easily in portion sizes to be reheated on demand and simply tossed with the pasta of your choice. Heat a saucepan up and add a glug of Olive Oil (enough to get the onions going), add onions and simmer until transparent (add salt to prevent them colouring too much). Add garlic and simmer for a minute or two – don’t allow garlic to catch or colour. Add mince and sauté – squishing the mince to prevent big lumps – until the mince is all well done and liquid has dried up and the pan is sizzling. Add dried herbs and pepper and simmer for a minute. Add tomato paste and cook for a few minutes. Add balsamic vinegar and soy sauce and simmer. Add tinned tomatoes and red wine & stir. Simmer for at least 30 minutes until reduced and flavours developed. 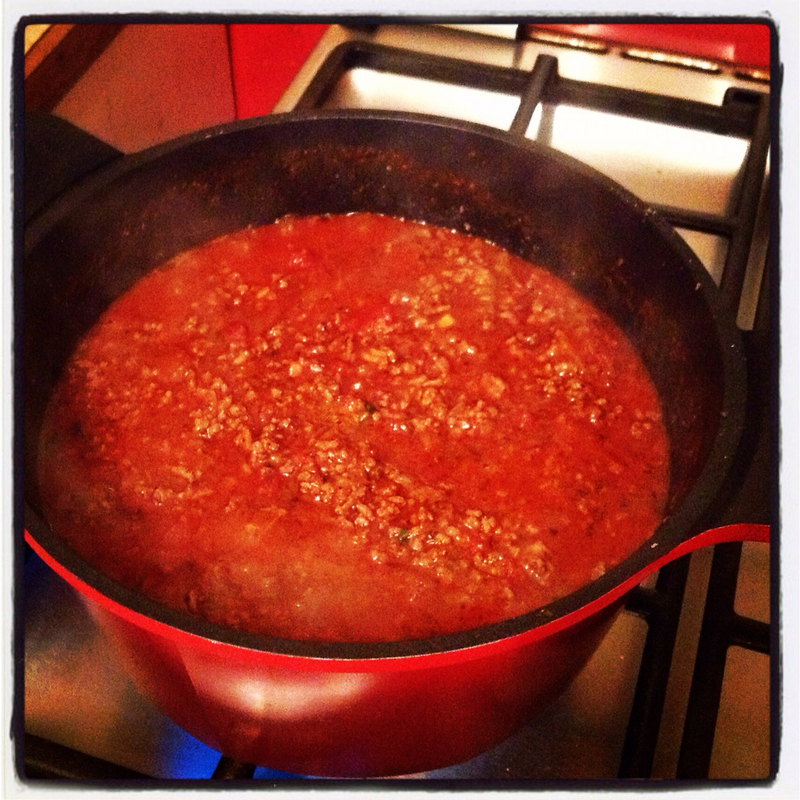 Allowing the mince to cook until all liquid has dried up and allowing each stage to sauté for a few minutes before adding the next ingredients makes all the difference in the depth of this sauce.